Are Mexico’s large cities growing faster than small cities? Aside from intra-urban moves (ie. those made within a city or town), the major focus of migration in Mexico has shifted from the largest cities to the medium cities (those with a population under one million). Medium cities, such as Mérida, San Luis Potosí, Querétaro and Hermosillo, attracted over 1.6 million new migrants compared to only about 1.3 million for the largest cities. The net migration gain of medium cities was almost 370,000, nearly twice that of the nine largest cities. The new focus of migration on medium cities rather than largest urban areas was stimulated by policies to shift growth away from Mexico City. This shift should help relieve the growing congestion in Mexico City and the other large cities. The pattern of migration from small towns and rural areas to urban municipalities continued throughout the 20th century and into the 21st century. 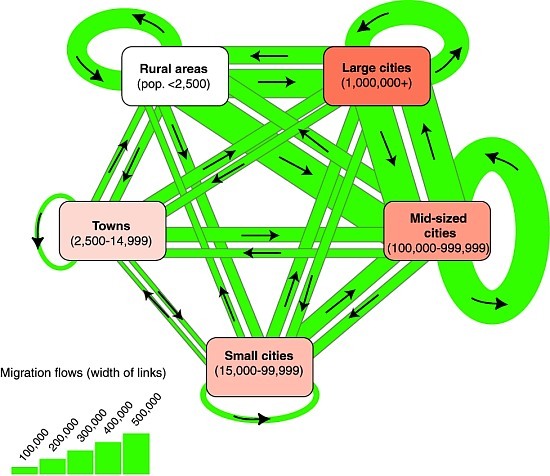 Between 1995 and 2000 over 1.7 million migrants left small towns and rural areas (see diagram). Where did these migrants go? Over 60% went to cities of over 100,000, which is not surprising because these cities have more dynamic economies with more employment opportunities. What is a bit surprising is that a full 27% moved to other small towns and rural areas. Many of these moves were to new corporate agricultural developments in the north. Personal and family factors were also important. Rural areas and small towns attracted almost 1.2 million migrants during the five year period. Over 60% came from cities of over 100,000, while almost 40% came from other towns and rural areas. Many of these moves were undoubtedly earlier migrants returning to their hometowns. The net migration loss of over half a million represented only about 1.6% of the population for the five year period. This is only about one eighth of the natural population increase in these areas. In summary, though small municipalities are experiencing relatively large rates of out-migration, they are also attracting many migrants. Their relatively low rates of net migration loss mean that Mexico should continue to have a substantial rural population for the next several decades. This post is an excerpt from chapter 25 of Geo-Mexico: the geography and dynamics of modern Mexico. Buy your copy today, and learn more about Mexico’s fascinating geography. The more knowledge you acquire, the more pleasure you will derive from your next trip to Mexico! The internet in Mexico: is there a digital divide? Are Mexico’s rural areas more diverse than its cities?